Manchester United have reportedly not offered a new contract to Juan Mata as he edges ever closer to becoming a free agent at Old Trafford. The Spain international showed he’s a player well worth keeping with a classy free-kick to inspire United to a memorable 2-1 away win against Juventus on Wednesday night. Mata remains a key part of this squad and he would surely not be short of suitors if the Red Devils don’t decide to try and tie him down, with the Daily Star recently linking Arsenal as one club in for him. 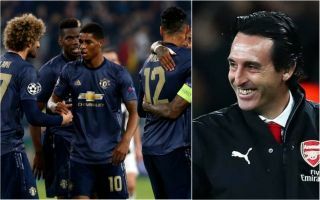 The Gunners are managed by Mata’s old manager at Valencia, Unai Emery, so that could be a reunion that makes sense, and the Daily Mail also claim that the 30-year-old wants to stay in England if he leaves, despite also looking like having offers in Spain. With Aaron Ramsey set to leave the Emirates Stadium, most likely on a free as well, according to BBC Sport, Mata could be an ideal replacement in that attacking midfield department. The former Chelsea man may not have been at his very best for United for a while now, but he showed against Juventus that the old quality is still there. One imagines Arsenal and others would gladly take him if MUFC continue to stall on offering him a contract, as the Mail suggest.